Identity theft has become more and more prevalent nowadays. I have personally been a victim of identity theft. My bank account information was used to make a purchase at a store I had never even visited, in a state that war far away from me. Thankfully, I saw he charge on my bank count and notified my bank right away. They mailed me a form to sign verifying that I had not made the purchase and I had to mail it back to my bank. This sounds easy enough to do, but the mailing back and forth takes time and that is more time the thief has with my information. I asked the bank to send me a new debit card and it took two weeks to get that in the mail. Again, that sounds easy enough but I pay for most everything using my debit card that is tied to my bank account. I felt violated that someone had used my information for personal gain. And, I had to wait to get my debit card. This meant going to the bank to cash checks or when using a check to pay for a purchase, I had to give all kinds of information for my check to be processed. This was not an experience I wish upon anyone. You never know who has access to your information and my case could have been much worse. I know of people that have had their entire bank account wiped out, causing them thousands of dollars in losses. With all of the identity theft going on today with major companies involved, I highly suggest you check out the LifeLock Site. They have many different levels of identity theft protection. I am sure you can find one that suits your needs. Don't fall victim to ID theft. 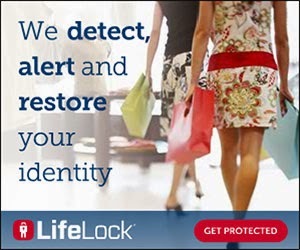 Check out the LifeLock Site today and get the protection you need! 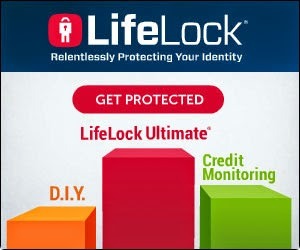 For all my readers, Lifelock is offering a 10% discount when you use the code: LifeLockSecure when registering for an account on the LifeLock Site. I highly suggest you take a look and get protected from ID theft. Life lock seems like such a smart thing to do. You can never be to safe. Lifelock seems like the right choice. My hubby and I have been discussing this for a while...I think we will be contacting them. We have also been talking about this. As people buy with credit cardsthe risk ie there. Thanks for this post. I have been interested in this for quite some time. Great advice! The number of identity thefts is skyrocketing and people need to be really aware of how easily they can get hacked. I know it is scarey what companies are being hacked! Just last week it was ebay. I remember when if you heard about identity theft it as to someone rich and it was rare. Now it's anyone all the time! My purse was stolen in April and when I (finally) talked to the detective handling my case, he suggested that I get this service! Thanks for this reminder! This is one of the better protections against identity thief. Thanks for sharing. We used lifelock after my purse was stolen and my identity was compromised! Having someone steal your identity is very scary. Good to know Lifelock helps protect you against that. I use my debit card for everything, so I really do worry about my identity being stolen! 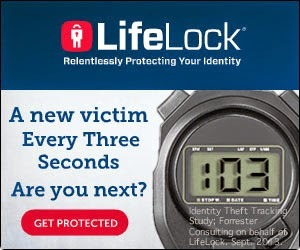 Life Lock is a good company and my brother uses this service to protect his identity too! I need to look into this. Such an important tool. We all should have something like this. My passport was stolen several years ago and I've often wondered who has it now and is pretending to be me. I Heard About This Now You Just Confirm How Great It Is Thank You I Really Need To Get This!! I've heard so many good things about Life Lock. I think I'll have to seriously look into it. Ive only heard good things about Lifelock. My purse was stolen years ago and it was a nightmare. For years my identity was sold over and over. It was awful. Lifelock would have helped me back then! Identity theft scares the crap out of me! I get so nervous about identity theft, especially when it comes to my daughters identity. I've heard man good things about LifeLock and your post adds to my positive perception! I do have LifeLock, but I'm also always watching my accounts on my own. This sounds great, my husband has had 2 bad innocents happen to him with someone stealing credit cards,scary. Never heard of life lock, but it looks like a very important thing to have! This sounds like a great security device. I will definitely look into it some more.